once upon a time, right before my senior year in college, I lived in new york city for a summer. it was exhausting & hot & rewarding & kinda magic all at the same time. I worked at a place called operation exodus. I worked long days, tutoring kids one on one, teaching classes, etc. & then after 5pm, when the work day was done, I walked 22 blocks home to the apartment, splashed some water on my face, studied one of the many “Fifty Million Most Awesome Things To Do In NYC Lists,” & went on an adventure, subway pass in hand. I would explore until I was too tired to keep walking & then come home & crash on the little apartment couch… & then wake up & do it all over again. like I said: exhausting but magical. I love cities. I think that it’s because I love people & cities are basically one big pile of people. the sheer population density is one of the most shocking things about new york. you are always sandwiched on top of one another… on the subway, in line at trader joes, on the sidewalk. & that gets really interesting when you have doctors & laywers & actors & teachers & the homeless all up on each other. you see, in jackson, there are homeless people. but usually they’re on the side of the road & you’re in your car. in new york city, homeless people were on also the side of the road. but in new york, the “side of the road” is the sidewalk. & you’re right there with them, along with an investment banker, a nanny & a dude dressed like a tiger. in mississippi homeless people were pretty easily ignored. in new york they were literally inches away from you… on the subway car, on the street, in the park. when something is that in your face, you have to decide what to do about it. especially in a place like nyc where a lot of homeless people were actively asking for money. that summer, I gave money to pretty much every homeless person I found. I’m not saying that to make myself sound really awesome & helpful. most of the time I just gave out change. and I understand that there are a lot of reasons why that’s not a good idea. sometimes helping hurts, you don’t want to add to a culture where some people are making a living off begging, etc. I understand all those reasons & see the validity. I think at first I started giving people money because I felt bad. but as the summer wore on & I thought about it more, I realized that giving people money was changing the way I felt about homelessness. because when you give someone something, you have to look at them. most of my life I had ignored people that were homeless… less out of apathy & more out of embarrassment or awkwardness. that summer, I realized how painful being ignored must be. being deliberately passed by… over & over, day after day. it’s pretty dehumanizing. statistically speaking, a lot of homeless people suffer from mental illness. & you can’t help but wonder… what comes first, insanity or being ignored? you could see how they might feed one another. as I thought about these things that summer, my goal shifted… from giving people money to simply paying attention to people. that meant when the guy in the park tried to come sell a CD to me, I didn’t necessarily buy it… but I listened to his speech & instead of saying “no thanks” I asked him questions (he told me all about how obama was involved in a conspiracy to blow something up & I should be careful). when I passed people on the street, I tried to lock eyes & speak. even when it was uncomfortable. it’s usually uncomfortable. but the thing about making eye contact & speaking is that it goes beyond charity & acts of service to basic human dignity. the other day I was walking back to the office in downtown jackson. from across the street, I spotted a man that looked homeless. & very honestly, my first inclination was to keep going on the opposite side of the street instead of crossing where I usually cross, because crossing would mean we were walking side by side. but as I thought that, I realized how ugly that thought was. & remembered that people are people. we might be different, but we want the same things. so I crossed the street. looked him in the eye, & smiled. & then right as I passed him by I heard “wait, excuse me ma’am…” & I turned. & he handed me the prettiest pink flower that you ever did see & said, “I want you to have this.” & pretty much broke my heart & made my day all at the same time. so basically what I learned in new york (& again last week in jxn) was this: give homeless people money or don’t, that’s not the real issue. but always make eye contact with them. speak to them. ask them questions (the answers might surprise you). & smile. I started with shy smiles but I think the eventual goal should be your million dollar smile. the one you give to cute babies in kroger & that guy you have a crush on. who knows, you could be smiling at jesus. 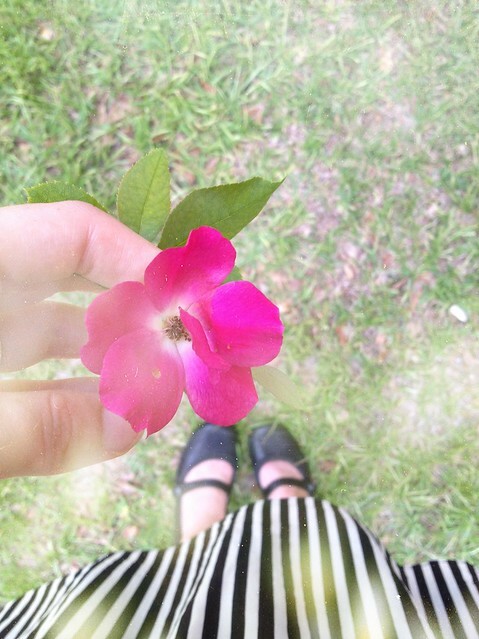 & he might just turn around & give you the prettiest pink flower that you ever did see. pales in comparison to whether or not we acknowledge fellow image bearers. but it goes without saying that when you’re hungry, money is very much a real issue. & sharing food & money is important. but helps them to access services they might need (jobs, healthcare, etc.). but there’s probably a place for sharing in the moment too. thank god for his spirit that leads us in the way we should go. This entry was posted in Uncategorized and tagged deep(er), neighborhood, NYC. Bookmark the permalink.